Simply beautiful, white Fraternal Dress. 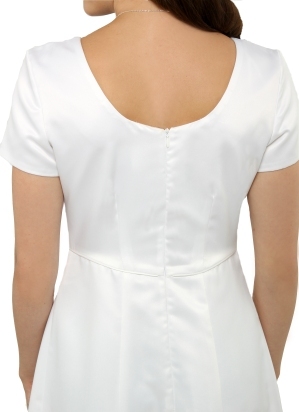 Made entirely in our white, matte satin and lined with taffeta for modesty. Back zipper for convenience. FWO Extras: Even though the neckline is a scoop neck, it is still modest. No cleavage is supposed to show while wearing this gown. The back neckline scoop is deep, but it is bra-friendly.